If my first love is butter, my second love is olive oil. 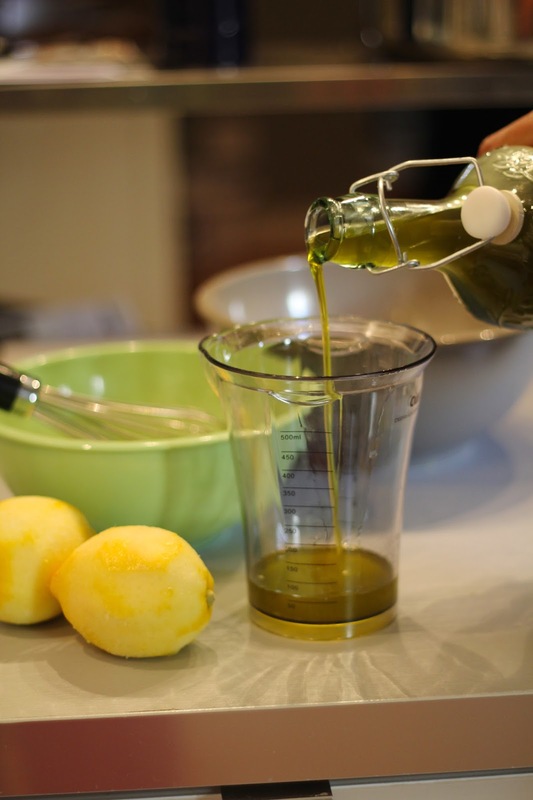 Nothing beats a good quality olive oil -- you can dip bread in it, drizzle it on your cream soups, use it to dress your favorite salad, cook with it and even bake with it. And outside of the kitchen, sometimes I even use it on my chapped lips or dry hair. The key to a good experience with olive oil is investing in a quality product. I know, I know, it's expensive! But I recently learned of a reasonably priced olive oil that tastes like a million bucks. So today, I've got two recipes that showcase this most special of ingredients. Last week, I had the opportunity to test out FreshDirect.com -- groceries delivered right to my front door, heck yeah! I found the experience of online grocery shopping really easy. Just search for things you need and add them to your cart. 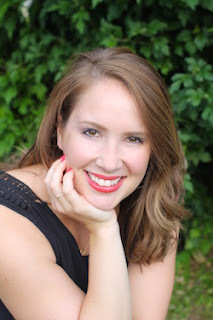 When you're ready to check out, you get a list of available two-hour delivery windows, so I was able to get my groceries delivered the next day between 7 and 9 p.m. which gave me enough time to get to the gym and home before my groceries arrived. 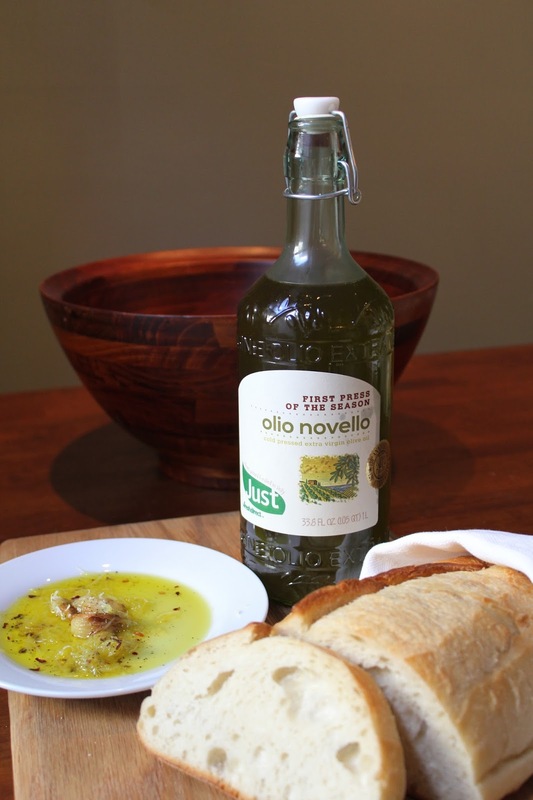 One of my favorite ingredients that I ordered was their Just FreshDirect Unfiltered Olio Novello. This olive oil is full-bodied, a little bitter, a little rich, and has a great peppery finish. It'll run you $20 for 33.8 oz which puts it in the mid-to-high price range for olive oil, but I think it tastes a lot better than most grocery store brands. First up, I had to try olive oil in one of my most favorite ways, as a dip for a nice crusty bread. Place garlic on a piece of aluminum foil and drizzle with a teaspoon of olive oil and seal the foil around the garlic leaving a small air pocket inside. Bake for 20-30 minutes until the garlic is soft and fragrant. Pour 1/4 cup of olive oil onto a small plate. Add roasted garlic, salt, pepper, red pepper flakes and parmesan. Serve with a warm crusty bread for dipping. Now that we talked savory, here's something sweet for you to try. 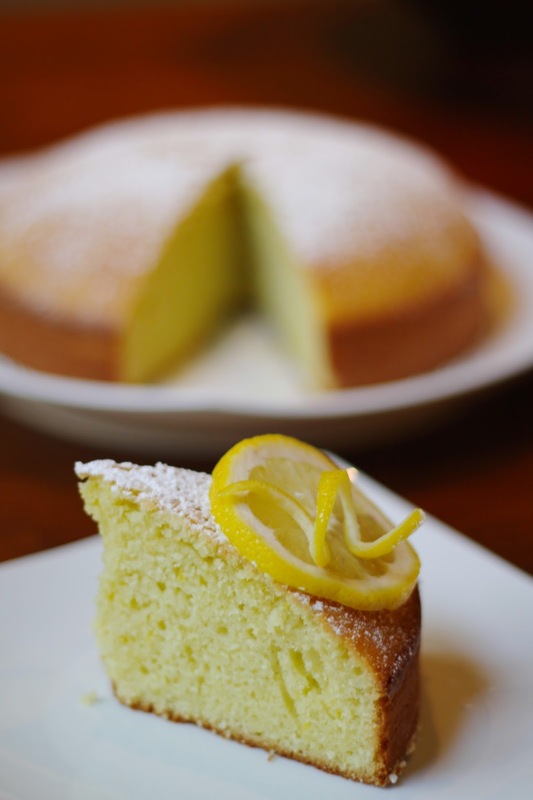 Olive oil cake. Never had it? Well it's basically the texture and flavor of pound cake minus the guilt of eating a cake that contains a pound of butter. Somehow it maintains a perfect balance of being simultaneously light in flavor and dense in texture, and perfectly moist. Preheat the oven to 350°. Butter and flour a 9-inch round cake pan. In a large bowl, using a handheld mixer, beat the eggs with the sugar and citrus zest until pale and thickened, about 3 minutes. Alternately beat in the dry and wet ingredients, starting and ending with the dry ingredients. Pour the batter into the prepared pan. Bake for about 30 minutes, until the cake is golden brown and the side pulls away from the pan. Transfer the cake to a rack and let it cool before serving. Serve with some freshly whipped cream and seasonal berries. Fun Tip: Both of these recipes are shoppable via Popcart. Just download the bookmark for your browser and then copy and paste any recipe to automatically create a FreshDirect order with the needed ingredients. This is a sponsored post by FreshDirect.com... all opinions and ideas are my own. a business and in some cases it does. We are offering to people for home delivery service. You will get home delivery service by spending $9.99. Online grocery delivery is the shopping experience of the future. With a few clicks of a button, one will receive their desired groceries at their door in the matter of a single day or even hours; no more having to make unnecessary, time-consuming trips to a grocery store.